Are you strong enough to quit smoking cigarettes? I’ve been smoking cigarettes on and off, for four years now. I like to smoke. 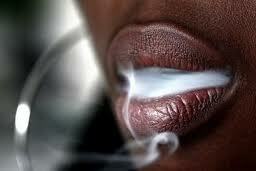 I like the rush I feel when the smoke hits my brain and releases endorphins, which calm me as I exhale. I like the taste of my food after a good smoke; it makes everything tastes smoked. I love the taste of the cigarette with a glass of wine, or other spirit. I like the first smoke of the day: It helps calm hunger pains before I eat breakfast. I love smoking in the car: I put my windows down, blare my favorite CD, and get lost in traffic as I blow smoke out the window. I love sitting around with my friends, relaxing to good drink, banter, stories…and my cigarette. Finally, I love a calming smoke after love-making, and before bed. What I hate is the after smell. I hate having to go to the restroom after every smoke to wash up, to re-apply lotion and perfume. I hate having to brush my teeth more than three times a day. I hate the yellowing color that my teeth are beginning to adopt. I hate wondering if my breath stinks. I hate that my eyes are drier, my skin is less elastic, and I’m starting to look older; even my smile lines are deeper. I hate that I my once, soft, pink lips are darker, and usually dry and ashy. I hate that I’m putting pressure on my lungs and heart. My breath is shorter; and as an avid swimmer, clarinet player and singer, I remember being able to hold my breath notes and keys a lot longer. Now, I’m a raspy-short-breathed jazz singer. All my ballads are reserved for my healing. So, two-weeks ago, I caught the Head Cold/Flu. This left me struggling with my once 2nd Soprano range. Worse than the head flu is the aftermath of congestion, phlegm, and hoarseness which is bugging the hell out of me! I want my range back. I’ve just been dissatisfied with the way I’ve neglected my health. It’s been on a downward decline. And I knew I needed to take better care of myself. After all, wasn’t I worth it? Was I lying to myself when I would affirm that I loved myself? Here’s to my year of progress in wealth, health and accomplishments! Next Are you strong enough to quit smoking cigarettes? If you want some good reasons not to smoke, please check out my page How Bad is smoking (http://guysandgoodhealth.com/how-bad-is-smoking/). Some 172,000 people died of lung cancer last year. Thank you so much, Tony. We all know the dangers of smoking, yet it seems a bit far fetched until it’s someone close to home who’s affected. I loved your page and will follow you. When I began smoking, I never intended to become a “smoker”…I never planned to purchase my own pack of cigarettes. I was a social smoker, having one every now and again…it’s not that type of recreation. My message to anyone is: DON’T START! HIGHLY ADDICTIVE AND DETRIMENTAL TO YOUR HEALTH!